Renowned physicist Richard Feynman gave a lecture in 1959 titled “There’s Plenty of Room at the Bottom”1 about the exciting premise of being able to manipulate individual atoms through advanced synthetic chemistry. This idea of direct synthetic control has taken shape as an area of research called nanotechnology, which has enabled technologies such as extremely small scale processors found in phones. One particularly exciting class of nanomaterials is the bright and colorful quantum dot. 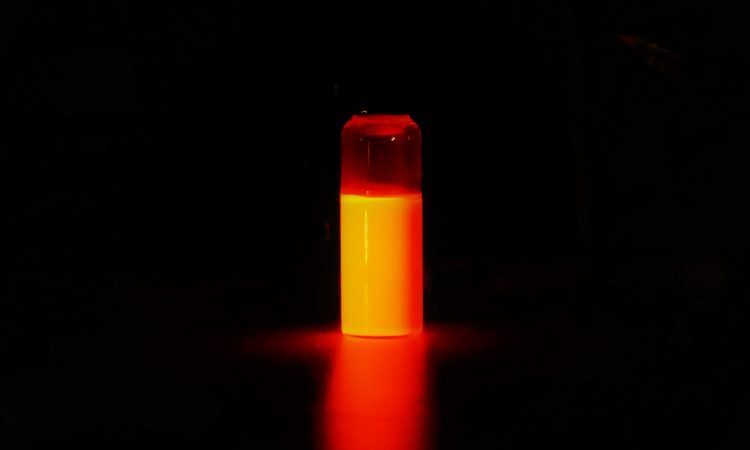 Quantum dots are small semiconductor materials that have unique interactions with light due to their size and have radii of ranging from 1 to 10 nm (as a comparison, the radius of a sodium atom is 0.18 nm). A traditional large-scale semiconductor absorbs light that is equal to or higher in energy than the band gap, which is the energy difference between electron orbitals in the material. Silicon is one example of a large-scale semiconductor that absorbs light at and below its band gap of 1100 nm ( 1.1 eV). In contrast, individual atoms and molecules have strictly defined absorbance wavelengths. For example, helium absorbs 12 specific wavelengths of light (338 nm, 447 nm etc.) and nothing else. This specific absorbance pattern is known as quantized or discrete absorbance. Methods to produce quantum dots in a controlled fashion were first developed in the early 1990s.3 Researchers found ways of growing tiny, evenly distributed clusters of one hundred to many thousands of atoms. The most prominent way for scientists to construct quantum dots is through colloidal chemistries. Typically, a crystal is grown from a saturated solution of precursors (think of salt crystals growing out of water). This solution produces bulk materials with sizes on the order of millimmeters to centimeters. Researchers used this understanding of crystal growth and found modifications to control the size of the growing crystals. This was realized through the use of ligands, which are agents that bind specifically to certain atoms. Ligands added to solution growth conditions selectively bind the atoms at the surface of the growing crystal and inhibit their growth. Chemists can quench the reaction to easily produce small-scale, crystalline semiconductors: quantum dots. What’s it being used for? The biggest success is the use of quantum dots by Samsung in their state of the art QLED TV. It’s a highly pure-color TV available right now. The display is absolutely incredible and based on using different size (and therefore color) quantum dots. The quantum dots are superior to previous technologies because their colors are much more discrete, e.g. the colors are individual pixels are a single color with no mixing. 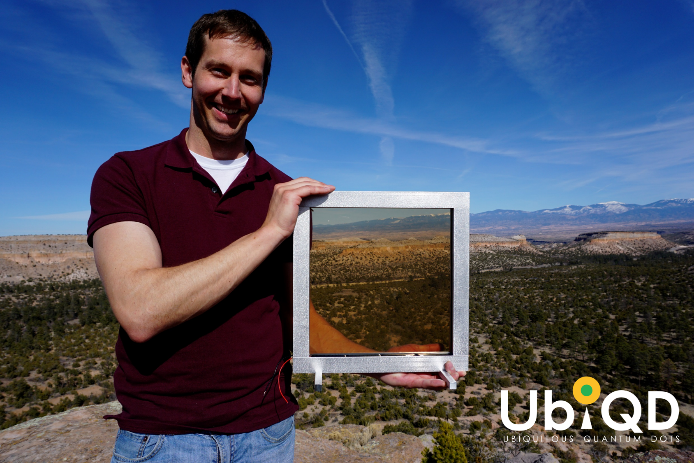 One exciting example of a future application for quantum dots is the solar window technology found at UBIQD, a startup company. These dual-function windows are semitransparent to allow light into the workspace while simultaneously capturing energy from incident solar rays. 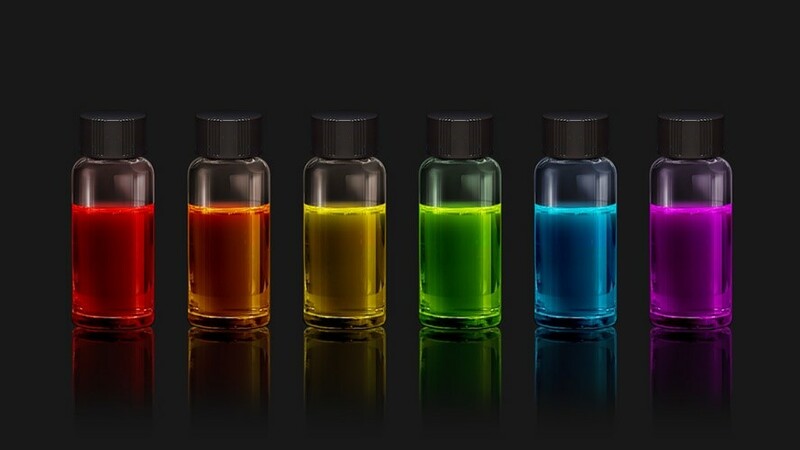 Quantum dots also have a lot more to offer for future applications! Researchers are working to develop these dots for quantum computing and4 medical imaging technology. All of these future applications may be enabled when researchers discover new materials to synthesize into quantum dots. Feynman, R. P. In There’s plenty of room at the bottom., Engineering and Science, Caltech, February; Caltech, 1960; pp 22-36. Alivisatos, A. P., Semiconductor Clusters, Nanocrystals, and Quantum Dots. Science 1996, 271 (5251), 933-937. Murray, C. B.; Norris, D. J.; Bawendi, M. G., Synthesis and characterization of nearly monodisperse CdE (E = sulfur, selenium, tellurium) semiconductor nanocrystallites. Journal of the American Chemical Society 1993, 115 (19), 8706-8715. Loss, D.; DiVincenzo, D. P., Quantum computation with quantum dots. Physical Review A 1998, 57 (1), 120-126. I love designing and making things. While my interests in science are all over the place, I like chemistry because it allows me to make things on the atomic level. My interests in research are mostly energy related: Solar panels, battery technology, and electronic components. Outside of my work, I'm an avid cyclist, nature enthusiast, and at home chef.